The number of brands advertising on Snapchat surged to 1,400 in 2018. That's the good news for the burgeoning social media app. The bad news is the vast majority of those campaigns were "one-offs" that ran only for one quarter or less, according to an analysis released today by media tracking service Media Radar. Overall, the analysis finds that two-thirds of Snapchat advertisers were active for one quarter or less in 2018. The report found that the third quarter was the most active for Snapchat, with the greatest number of brands advertising on the platform. Normally, the third quarter is a low-volume one for most media, because mass consumer brands generally heavy up in the fourth quarter as part of the holiday marketing season. The top five advertisers on Snapchat in 2018 were Comcast, Mars, AT&T, Adidas and Procter & Gamble’s. 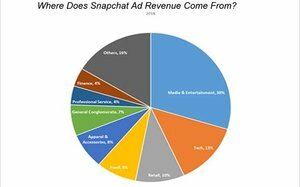 Media as the biggest advertising category, representing 30% of Snapchat’s ad spending in 2018, followed by technology (13%), and retail (10%). 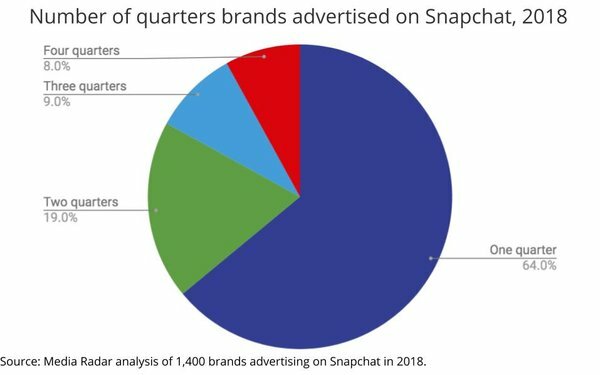 Source: Media Radar analysis of 1,400 brands advertising on Snapchat in 2018.